Knoco stories: The expert - dumber than the crowd? The expert - dumber than the crowd? Yesterday brought another fascinating blog post from the Farnham Street blog, entitled "The Expert Squeeze". The premise of the blog post, based on the book Think Twice: Harnessing the Power of Counterintuition by Michael Mauboussin, was that "as networks harness the wisdom of crowds, the ability of experts to add value in their predictions is steadily declining. This is the expert squeeze". 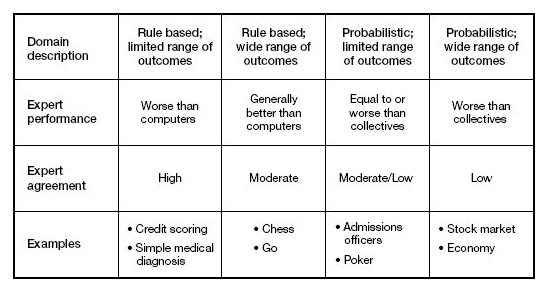 The blog uses the diagram above to show that where prediction is needed, the Expert is often beaten by expert systems, and never better than a collective view. Does this mean "the death of the expert"? In the new connected world, do the experts have a role, or are they squeezed out? We have addressed this issue already on this blog (for example here and here) where we recognise that a Community of Practice will ideally always contain more knowledge and experience than any one expert. This results in a shift in the expert's role. From being the "font of all knowledge" they become the "stewards of knowledge". Stewardship is different from ownership - a steward maintains and nurtures something that is not theirs, for the benefit of others. The exerts can take on a Knowledge Management role that involves becoming a Practice Owner or Practice Steward for their domain of practice, and playing a coaching an supporting role in the relevant Community of Practice. They also share their own knowledge through coaching, training, and contributions to the Community, and take technical roles on difficult and challenging pieces of work where they can apply, with wisdom, the knowledge of the community. The point which the diagram above does not make, is that the Expert becomes a critical part of the collective. Without the experts taking part in the collective, the collective can become "the blind leading the blind". We have seen this in one large organisation, with huge communities in which the experts take no part as they are "too busy". Not only are questions in the communities not answered (or answered with platitudes), the experts deride the communities as having no relevance. So let us recognise the new world, where the crowd can be smarter than any single expert. so long as the experts are given a new role within the crowd, and feel themselves to be stewards of the knowledge within the collective.